Hero Histories: Put Western Women under the Christmas Tree! The tradition of Old West-themed Christmas presents dates back to the late 1800s, and was immortalized in the modern Xmas film A Christmas Story written (and narrated) by the late, great, Jean Shepherd . Ralphie's quest for a Red Ryder BB Gun was mirrored by countless little boys (and probably more than a few girls) of the 1930s-1950s! We at Atomic Kommie Comics™ believe the tradition should be upheld...but with a twist! 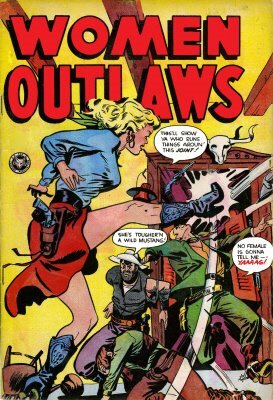 As part of our ongoing Christmas List of Pop Culture Stuff, we suggest...Women Outlaws, one of the coolest lines in our Western Comics Adventures™ section! Think Barbara Stanwyck or Jane Russell in comic book form! We're talkin' Horses! Leather! High-heeled boots! ShootOuts! Dominant females who don't take no sh!t! And...CatFights! Wah-HOO! Besides the usual t-shirts, mugs, and other collectibles, these kool retro images also adorn women's duds! Jersey Tees, Spaghetti tanks! Thongs! If women who can ride and shoot as well as any man ain't yer cup of prairie coffee, we also have Real-Life Westerners, Broncho Bill, The Cisco Kid & Pancho, Kid Cowboy, Masked Heroes, Native Americans, A Wealth of Westerners, and even Western Love!